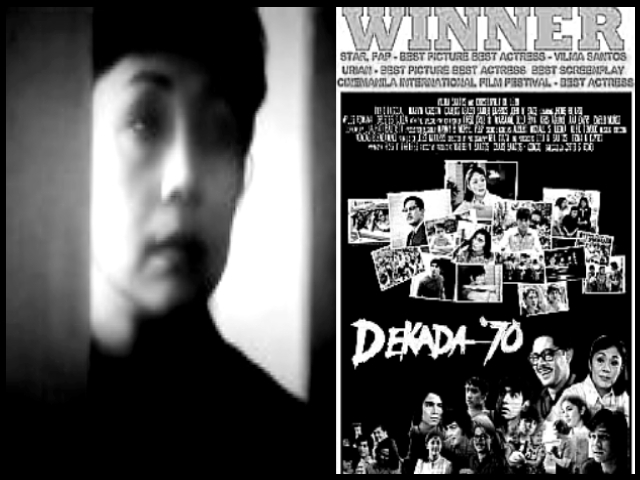 Dekada ’70 (English: 70s Decade) is a 2002 Filipino drama film released based on a book called Dekada ’70 written by Filipino author, Lualhati Bautista. The film tells the story of the life of a middle-class Filipino family who, over the space of a decade, become aware of the political policies that have ultimately led to repression and a state of Martial law in the Philippines. Filipina actress Vilma Santos stars as Amanda, who realizes the implications of living within a dictatorship after sorting out the contradictory reactions of her husband and five sons. Her husband (Julian), played by Filipino actor, Christopher de Leon, supports his eldest son’s (Jules), played by Filipino actor, Piolo Pascual; efforts to rail against the government while refusing to follow Amanda’s wish to find a job. Her second son (Gani), played by Filipino actor, Carlos Agassi, is in the United States Navy. Her third son (Eman), played by Filipino actor, Marvin Augustin, writes illegal political exposes. The fourth son (Jason), played by Filipino actor, Danilo Barrios fell victim to a corrupt police department, and her youngest son named (Bingo), played by Filipino actor, John W. Sace, is still a boy. – Wikepedia (READ MORE). This year’s Metro Manila Film Festival (MMFF) sports a new name, but its trademark controversial image and reputation remain the same. The 28th MMFF has included a “P” in its official name. The “P” which stands for Philippines, means the entries in the festival can now be seen nationwide. The cast of “Dekada ’70” staged a walkout. A special effects awardee returned his trophy. A film that failed to make it to the filmfest’s top seven won thrid best picture. These and other inconsistencies were the “highlights” of this year’s “Gabi ng Parangal” awards ceremony last Friday. Piolo was “Dekada ’70’s” biggest winner as best supporting actor for his compelling portrayal of a tortured rebel leader in Chito Rono’s period drama. John Wayne Sace, who plays Pascual’s brother Bingo, bagged the best supporting child actor award. “Dekada ’70” also bagged the second best child actor award. “Dekada ’70” also bagged the second best picture award. Regal Films’ “Mano Po” romped off with the most number of awards, including the best actress plum that went to Ara Mina, who best-ed the veteran “Dekada ’70” star Vilma Santos. Eddie Garcia was adjudged best festival actor, while Joel Lamangan was named this year’s best director. Kris Aquino won best supporting actress also for “Mano Po.” Regal Films matriarch Lily Monteverde thanked the filmfest committee in Aquino’s behalf. Mother Lily has two more reasons to say “Chi chien” after “Mano Po” won best picture and best original story for writer Roy Iglesias. Iglesias also won the best screenplay citations for “Mano Po.” Resty Garchitorena and Tara Limberger took home the best cinematography and best film editor awards, again for “Mano Po.” The cross-cultural drama, which even partly filmed in Beijing, China, bagged a toral of 12 awards that night. Bong de Guzman snatched the best musical score trophy from such veteran composers as Louie Ocampo, Nonong Buencamino, Jimmy Fabregas and Elmer Sayson. This entry was posted in ARTICLES, FILM REVIEW, VIDEOS and tagged Ana Capri, Carlo Muñoz, Carlos Agassi, Charo Santos-Concio, Chito S. Roño, Christopher de Leon, Danilo Barrios, Dimples Romana, FILM REVIEW, FILM REVIEW: DEKADA '70 1/2, Jhong Hilario, John Wayne Sace, Kris Aquino, Lualhati Bautista, Manjo del Mundo, Manny Morfe, Marianne De La Riva, Marvin Agustin, Nonong Buencamino, Orestes Ojeda, philippine movies, Piolo Pascual, Tirso Cruz III, Vilma Santos, Vilma Tuazon, Wency Cornejo. Bookmark the permalink.